Atlanta United got the better of San Jose Earthquakes in a seven-goal thriller in the MLS on Wednesday. It was bottom of the Western Conference against top of the Eastern, but you would not have known it early on as Nick Lima put San Jose into the lead. Former Fulham striker Danny Hoesen then made it 2-0 to the home side, albeit at the second attempt, before Hector Villalba brought Atlanta back into the contest. However, another great individual strike, this time from Valeri Qazaishvili, restored San Jose's two-goal advantage, before a huge talking point in the game. The hosts thought they had scored a fourth when Chris Wondolowski netted, only for the Video Assistant Referee (VAR) to disallow the goal for a handball down the other end of the pitch. 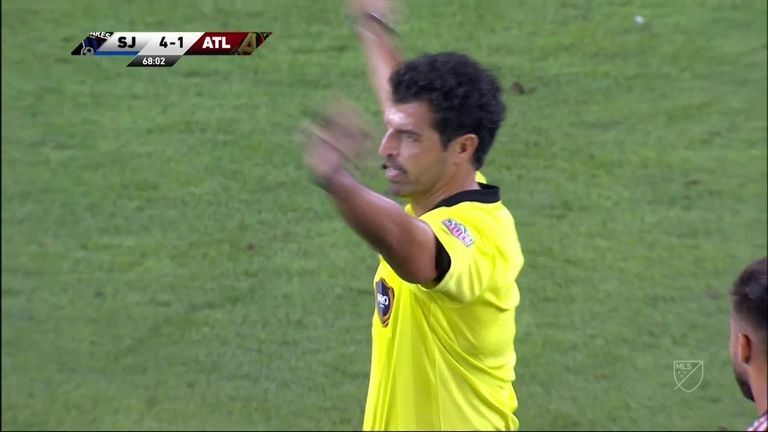 Following the review, a penalty was awarded to Atlanta which Josef Martinez converted for his MLS-record 29th goal of the campaign to cut the deficit in the 70th minute - marking the start of a chaotic final 20 minutes. After Miguel Almiron levelled the scoreline three minutes later, Martinez produced the winning moment five minutes into added time to complete the remarkable turnaround and consign interim boss Steve Ralston to an opening defeat. Meanwhile, Fafa Pico scored a 93rd-minute winner for Philadelphia Union as they ended Seattle Sounders' nine-game winning run. Cory Burke thought he had given Philadelphia a 65th-minute lead but the referee took a second look - and ruled it out for offside with the help of the VAR. Seattle had plenty of chances to score, with Will Bruin missing a great chance, while the Union were reduced to 10 men late on when Jack Elliott was received a second yellow card. And with Seattle pressing for a winner, a mix-up at the back led to Philadelphia's winner. Elsewhere, Portland Timbers recovered from their 4-1 thrashing at Houston to come from behind to beat Columbus Crew 3-2. Things got off to a bad start for the home side as, after just seven minutes, Niko Hansen opened the scoring for Columbus. But it wasn't long before Portland had a goal of their own as Andy Polo set up David Guzman for the equaliser. Just minutes into the second half, Portland got their third with Samuel Armenteros' shot deflecting in off Lalas Abubakar for an own goal. And in added time, Columbus pulled a goal back through Hansen, but it wasn't enough.